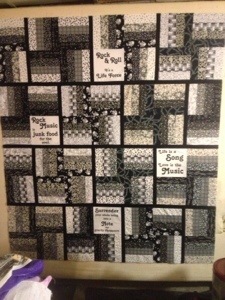 I worked a bit more on the rock & roll quilt last night. All that’s left is to add the borders. I haven’t quite decided what I will do with the borders as I would like to put the words Rock & Roll from the panel somewhere in the border. We’ll see….. When I was deciding on the blocks for this, I needed 8″ blocks, but when you put them into sets of 4 they become 16″ blocks. I didn’t like the size it was ending up using 3 blocks per row, so I used 3 1/2 blocks per row and alternated the half blocks on the ends. The sashing strips help show the blocks. I like the way it came out. That’s I for now. Have a good day!